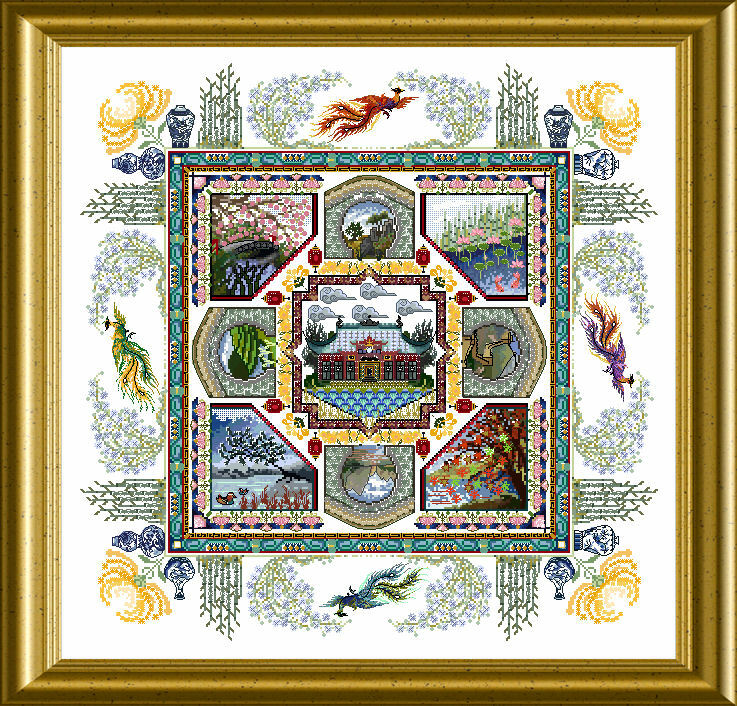 This is a design brimful with details, colors and intricate items. 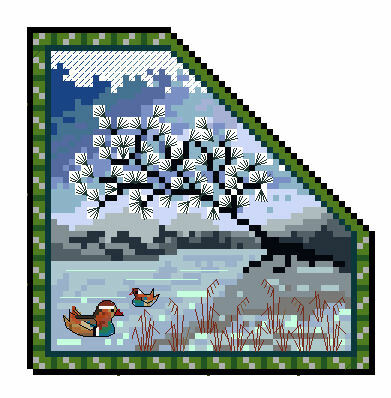 You will have lots of fun exploring it’s secrets while stitching it ! Some over-one for smooth detail, lots of Special Stitches, beautiful silks in solid and variegated shades, effect threads and braids, beads and crystals- it is all there ! 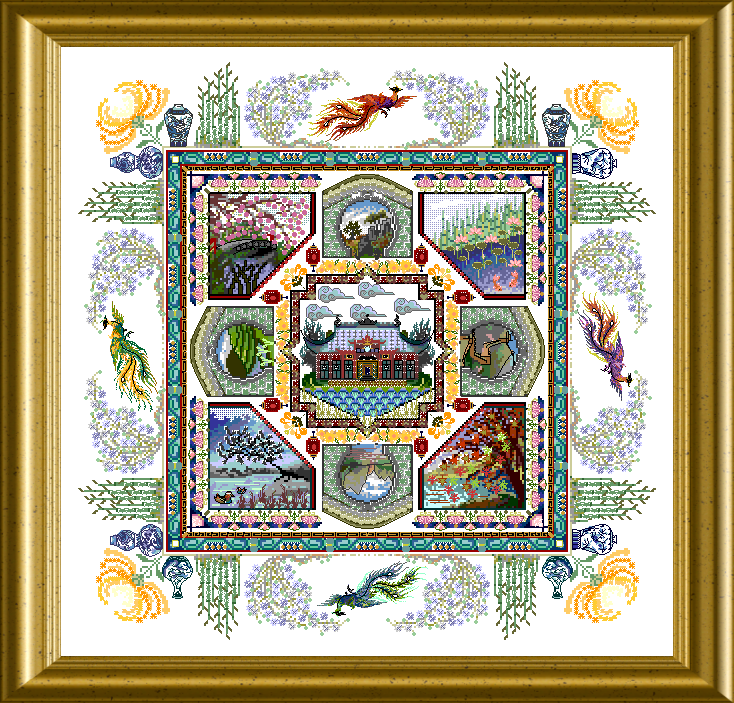 Different landscapes in seasonal color changes – views into Chinese landscapes throught the Moon Gates – a tea house in the very center… Phoenixes where you can decide to stitch them over-two or perhaps over-one ? I have a question for help. I check the materials list.you know the whole threads have the conversion into DMC,like SNC 290 can conversion into DMC 523.But what does the DMC number”na 677 poss ” mean? (the material is SNC 289). I can’t find the same number in DMC list….the same problem is be found in SNC 291,SNC 122.So can you give me any suggestion for suitable relace threads for the SNC 289,SNC291,SNC122 and SNC 306.Thank you very much . na means not available – there is no match. If variegated colors have too many different colors flowing into each other, there is no possible match in ONE DMC. If a substitute is poss => possible, I give it. But if there is none, there is no way to substitute the variegated silk into a solid colored DMC. Hope this helps. here – on my site. Put your desired chart in the cart – pay with Paypal – and download from the link. I can’t find it anywhere because it is no longer in the collection. Maybe you no a substitute I can use, I prefer a silk variegated color. Hello Margriet, this is the bad thing with the hand made threads that they can be out of sale sometimes. You will find a DMC conversion for most of the variegated threads – you can use this. I do not have conversions into other brands’ variegated threads – sorry. What count fabric do you recommend for this pattern? Thanks. I recommend 28 count,or 32 for an experienced switcher. Where can I get the fabrics and threads, etc. For this pattern? Hello how can i Order the whole kit ( to get all together the beads , and all the threads… )? Hi, you can get beautiful kits from European Cross Stitch, on chatelaine.de you can purchase the PDF-Charts.